I love my Karina dresses, all year-round. They are so comfortable and versatile – the sleeveless Jenny dress I’m wearing today looks great over a slim fit tee or under a boxy sweater for cooler days. It’s not steamy hot here yet, so lounging outdoors under the sea grape tree still feels wonderful. 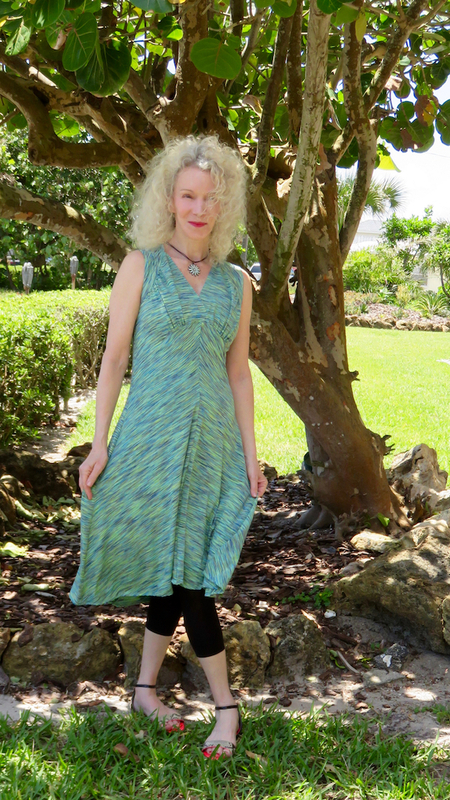 This Karina dress has seen a lot of wear; it washes and dries in a flash and never wrinkles. The colors remind me of the ocean, just 50 yards to the east, lucky us. I added only some lightweight capri leggings (similar) and a newly-thrifted flower pendant (sim). The flat ankle strap sandals (sim) were a gift from a company that’s now closed its doors. 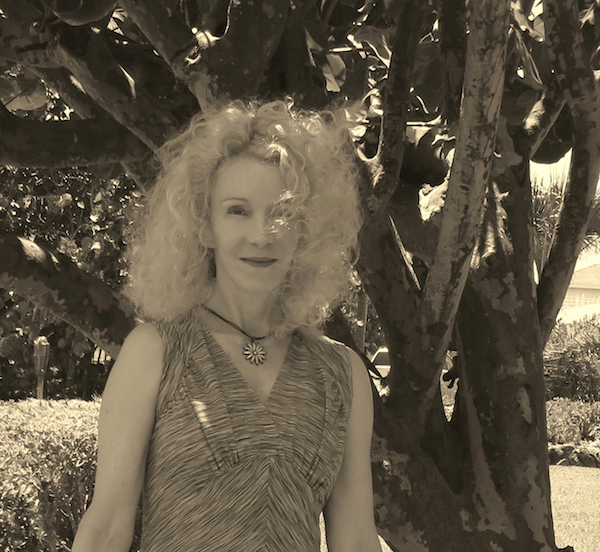 I like this black and white photo because it shows the necklace well, and makes the tree branches look like proper camouflage. I will be working from my tablet while away, so I may not get to all your posts to comment. Thank you in advance for sharing all the wonderful looks, and for being dear Vis Mon friends. This is one of the dresses I was coveting from Karina! I love this soft sea blue color on you! Fantastic, gorgeous necklace as well. I love this sleeveless style and with your figure ! This Karina dress looks lovely on you and the color with your hair is sublime. Your blog is looking great, Patti! You look so pretty in sea green, Patti. And the addition on black leggings gives you a cool jive, man. Dear Patti, happy Birthday! You look so fresh and beautiful in this dress! Such a flattering feminine silhouette and fantastic color. All my best wishes! My favorite color and you look great in this dress Patti. This dress *swoon* <3 I joined their mailing list a while back because of you & there are quite a few dresses I'd buy if they came in my size. I'm going to link up my most recent blog post here featuring a brand I adore that makes their dresses in size XS to 4X. While I realize that still leaves some women out…it is my dream someday to have the majority of brands have this wide of a size range. Clothes have the power to make us feel pretty & confident…all women need that. I love looking through your visible Monday & seeing so many happy women, thanks for bringing them all together. I have always loved that colour. This dress is beautiful, and even more attractive with its easy care guidelines. I love the hippy sweetness of the necklace you’ve added. Thanks for the linkup, Patti! You’re so right—the colors of this dress are very serene!! I like the dress with the leggings…what a great idea when you want to wear a dress, yet may be at an activity where there could be exposure!!!! Hmmmmm…I’ll have to remember this! You always look like a breath of fresh air, Patti! Just beautiful! I hope you are having an extra special fantastic day in NYC! Wow love this easy breezy look Patti! I love this cute, breezy dress, It looks great over the cropped leggings. Happy Memorial day! There’s nothing better than blues and greens at the height of summer! SO soothing and cool! Great find with that necklace! Beautiful colors in your dress and a very flattering fit! I enjoy seeing how you have styled it with capri length leggings and sandals. You have convinced me I need to try layering some of my dresses like this. Great dress and fabulous you. Enjoy your long weekend and thank you for your always lovely link up. Patti, luv that colour on you! You look great .. Happy Memorial Day weekend … thank you for hosting. Beautiful dress! I love a styled with the leggins and the pretty necklace! Have a fabulous time in NYC!!! That’s just a beautiful colour on you, Patti! Lovely dress! Thanks for hosting Visible Monday! Uhoh, the sheepish expression has returned. Your hair, wafting in the wind is fab! Your dress looks like the Caribbean! Happy Memorial Day weekend, Patti! I love the dress with the leggings…a great look. Thanks for the link up….and always fun. Have a very special birthday…over 60 has been a lot of fun! My kind of dress, comfy, gorgeous and no wrinkles, just darling. You look so pretty in that color hue and ready for a stroll along the water!! Happy Birthday Gorgeous!! Beautiful dress, Patti…I hope you’re having fun in New York! Pretty look. Thanks for hosting. Ocean colors are some of my favorites. This dress looks great with the leggings. Thanks for hosting the link up, Patti. It’s a beautiful shade of green, suits you well. Have fun and enjoy your holiday! And happy birthday! Hi Patti! You look very serene in this dress. Yes, I agree, the colors remind me of water.